AJK Engineers (Pvt.) Ltd. has experienced professionals to carry out pile load tests up to 3000 tonns and more. Design of compression pile load tests with detailed instrumentation including vibrating type strain gages, Linear Variable Differential Transducers (LVDTs), extensometers, digital recording and controlling system and image analysis along with conventional measurement techniques. Design of compression pile load test with base grouting in addition to all instrumentation mentioned above. Design of lateral pile load test with detailed instrumentation like inclinometer, Linear Variable Differential Transducers (LVDTs), digital recording and controlling system and image analysis along with conventional measurement techniques. Pile Dynamic Analysis (PDA) test to develop a correlation between PDA and compression pile load test. Sonic Integrity Tests to check the soundness of concrete. 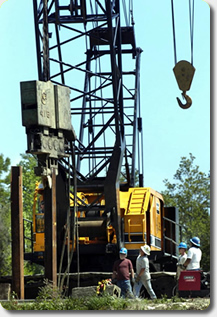 Detailed report on pile load tests including interpretation of results and recommendations.